The Scottish Football Association (SFA) was founded at a meeting held at Dewar's Hotel in Glasgow on 13th March 1873. Clubs represented at this meeting included Queen's Park, Clydesdale, Dumbreck, Eastern Granville, Third Lanark and Vale of Leven. Archibald Campbell (Clydesdale) was elected president and Archibald Rae (Queen's Park) became secretary of the SFA. The Football Association had been established in 1872 and it was decided that the England v Scotland match should became an annual fixture. In 1876 Wales established its own Football Association. Later that year Wales played Scotland. The more experienced Scottish side won 4-0. The Irish Football Association was formed in 1880. They played their first game in 1882 when they were beaten 13-0 by England. The following year the British International Championship was established. Each country met the other three over the course of the season. Scotland won the initial championship by beating England (1-0), Wales (4-1) and Ireland (5-0). The following season Scotland scored 8 against both Wales and Ireland. However, they could only manage a 1-1 draw against England. At this time the different football associations only selected amateur players. However, on 17th March, 1884, James Forrest won his first international cap for England against Wales on 17th March, 1884. England won 4-0. The following year he was selected to play against Scotland. Scottish officials complained as they argued that Forrest was a professional. At the time he was receiving £1 a week from Blackburn Rovers. Forrest was eventually allowed to play but he had to wear a different jersey from the rest of the team. Forrest is now acknowledged as being the first professional to win an international cap. 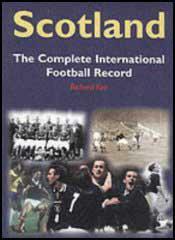 Scotland refused to select professional players or those who were playing in the Football League in England. This issue was discussed by the Scottish Football Association in 1893 but rejected by 20-4. Thomas Lawrie, the president of the SFA, argued "that all Associations should unite to stamp out professionalism". The Scottish League was established in 1890. Queen's Park, an amateur club, was not allowed initially to take part in the competition. Abercorn, Cambuslang, Celtic, Cowlairs, Dumbarton, Glasgow Rangers, Heart of Midlothian, Renton, St Mirren, Third Lanark and Vale of Leven competed for the title in the 1890-91 season. At a meeting of the SFA in May 1893, J. H. McLaughlin of Celtic proposed the motion to accept professionalism. He argued "you might as well attempt to stop the flow of the Niagara with a kitchen chair as to endeavour to stem the tide of professionalism". McLaughlin's argument was accepted and Scottish clubs were able to pay players. It was not until 1896 that the SFA began selecting Scots playing in England. On 25th March Ted Doig (Sunderland), Thomas Brandon (Blackburn Rovers), James Cowan (Aston Villa), Thomas Hyslop (Stoke) and John Bell (Everton) played in the Scotland team that beat England 2-1. Over the next few years, Scotland and England dominated the British International Championship. It was not until Ireland was involved in a three-way tie in 1902-03 that there were signs of a shift in power. Wales won the title in 1906-07 and Ireland did it in 1913-14. After the First World War, Scotland emerged as the leading football power in Britain. Their chief rivals were Wales who won the championship six times between 1920 and 1937. In the 1920s and 1930s English clubs would routinely release players for the England national side whilst simultaneously refusing to do so for the three other home nations. One person who suffered from this policy was Alex James of Preston North End. This was one of the major reasons why he sought a transfer to Arsenal in 1929. Although England, Scotland, Wales and Ireland played in friendlies against foreign opponents, no British teams took part in the first three World Cups.